Briefly - "The Lincoln-Douglas Debates of 1858"
Oxford University Press has released a new edition of The Lincoln-Douglas Debates of 1858 (ed. Robert W. Johannsen). This 150th Anniversary edition has a new foreword by historian James L. Huston. As a critical review of the modern debate scholarship, this lengthy (30+ pages), annotated essay provides readers with a thorough introduction to the debates, along with a summarization & critique of the continually evolving scholarly arguments about their meaning. The complete text from each debate is laid out in seven chapters with endnotes. Supplementing these are two earlier, and frequently referenced, speeches -- Lincoln's famous House Divided speech and Stephen Douglas's July 9, 1858 address in Chicago. While the foreword and the main text alone are useful enough reference tools to make the new edition worthy of consideration, the lack of an index is unfortunate. Beyond Huston's essay, additional commentary to the transcribed speech texts is limited to Robert Johannsen's brief notes. 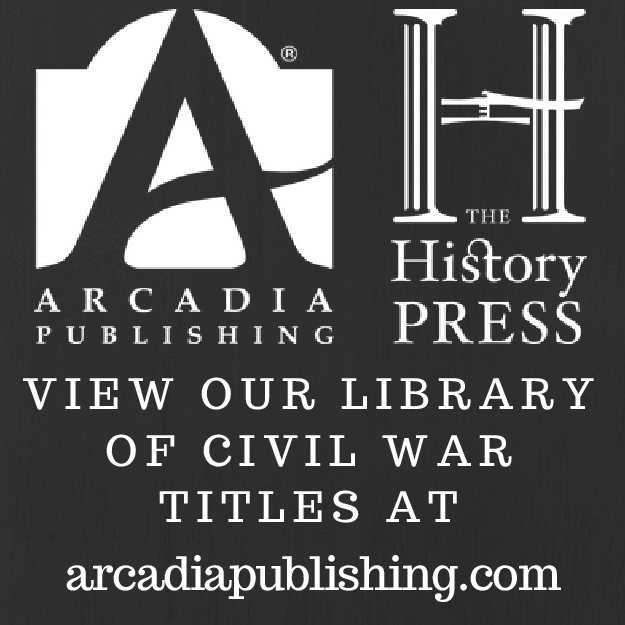 The Civil War Ends: Greensboro, April 1865 - A Historical Study of the Civil War in Guilford County by Bradley R. Foley and Adrian L. Whicker (Guilford County Genealogical Society, 2008). As a collector of local Civil War histories, I was pleased to receive a copy of this brand new publication, which appears rich in content. If you have any interest in the subject, get one while they last. These short print run books typically sell out quickly and are not reprinted. Chancellorsville and the Germans: Nativism, Ethnicity, and Civil War Memory by Christian B. Keller (Fordham Univ. Press, 2007). "German" units had already compiled a stellar combat record in the West and Trans-Mississippi theaters before the famously negative fallout from Chancellorsville commenced. I will be interested in finding out if Keller discovered significant regional differences in nativist attitudes. Roll Call to Destiny: The Soldier's Eye View of Civil War Battles by Brent Nosworthy (Basic Books, 2008). The title seems to imply an individual perspective, but the narrative actually uses higher organizations (batteries, regiments, brigades, etc.) to examine the nature of combat between the three major combat arms. Planting The Union Flag In Texas: The Campaigns of Major General Nathaniel P. Banks in the West by Stephen A. Dupree (Texas A&M Press, 2008). A number of excellent military studies separately examine the various Union campaigns directed at Texas, but this new one is the first attempt at a comprehensive interpretation. Summers with Lincoln: Looking for the Man in the Monuments by James A. Percoco (Fordham Univ. Press, 2008). I hadn't heard of this new Lincoln study before it landed on my porch with Keller. Looks to be an attempt to interpret Lincoln and his legacy through outdoor sculpture art. Sounds like an original approach. Greene: "The Final Battles of the Petersburg Campaign"
Considering its extended duration and multi-faceted significance, the 1864-65 Petersburg Campaign continues to be short shrifted in the Civil War literature. One fine popular overview exists, along with a number of H.E. Howard series volumes and Richard Sommers's massive history of Grant's Fifth Offensive1. Covering the period March 25 - April 2, 1865 in vast military detail, A. Wilson Greene's Final Battles of the Petersburg Campaign: Breaking the Backbone of the Rebellion is very much in the tradition of Sommers. First published in 2000 to high regard, Greene's study has now been reprinted by University of Tennessee Press [note: the title & subtitle have been reversed between editions]. Greene's overview of the Petersburg Campaign leading up to its final decisive week includes an intimate portrait of the officers and men of Union General Horatio Wright's VI Corps, and also of their primary opposition, the Confederate divisions of Generals Cadmus Wilcox and Henry Heth (III Corps). The author's research into Confederate subsistence during the 1864-65 winter months led to the interesting conclusion that the extreme privation so often repeated in later histories was by no means universal in the southern camps. The issue of increasingly rampant desertion from Army of Northern Virginia during this period is also examined. A number of battles [Ft. Stedman, Jones's Farm, McIlwaine's Hill, Lewis's Farm, White Oak Road, Dinwiddie Court House, and Five Forks2] contributed to overall Union victory during the decisive week preceding Petersburg's fall, but Greene concentrates his attention on Wright's breakthrough on April 2nd. While preceding battles defeated and isolated a large proportion of Lee's army west of the city (and forced the Confederates in the trenches to thin their lines to one man every five to six feet to make up for the loss in strength), the author makes the argument that the VI Corps attack was most immediately decisive, "breaking the backbone" of the Petersburg defenses and leading to their evacuation that very night. The specific point is arguable, and perhaps the distinction is ultimately irrelevant, but Greene abundantly supports his contention3. In terms of the results of the April 2 fighting, the author, citing the arrival of fresh Confederate brigades and the disorganization and exhaustion of the Union attackers, is not highly critical of Grant's decision to suspend the attack late in the day. Utilizing a truly monumental collection of source materials, Greene's masterful reconstruction of the fighting on April 2nd -- the dramatic and thematic centerpiece of his study -- is written from a variety of viewpoints ranging from privates to generals. The depth of detail within the narrative is marvelous to behold (almost overwhelming, really), but the transitions were quite easy to follow throughout. Clarity is greatly aided by the high number and quality of the cartography [by George Skoch]. Maps depicting the movements and fighting on the 2nd are often at regimental scale, and include appropriate terrain and battlefield landmarks. Brigade and division-scale maps of the battles fought prior to 'The Breakthrough' provide equally useful visual overviews. A large portion of the text (120 pages) is devoted to Greene's insightful explanatory notes. Appendices include orders of battle and a brief discussion of the current state of the various battlefields covered in the text. An extensive bibliography and detailed index complete the volume. Exhaustively researched and composed, A. Wilson Greene's4 The Final Battles of the Petersburg Campaign is a military study almost epic in scope and an essential addition to the campaign literature. Readers overwhelmed by Richard Sommers's magisterial Petersburg work Richmond Redeemed may find Greene's manuscript similarly daunting, but dedicated students will revel in its depth and richness of detail. Very highly recommended. 1 - Noah Andre Trudeau, The Last Citadel: Petersburg, Virginia, June 1864-April 1865 . Other short overviews exist as well, of course, along with works dealing with various aspects of the Crater battle. I haven't read any of the Petersburg-related volumes from the H.E. Howard series, but if the normal pattern recurs, quality is likely to be a mixed bag. Richard J. Sommers, Richmond Redeemed: The Siege at Petersburg . 2 - While not recounted at the micro level accorded the actions on April 2, detailed overviews of all of these battles are provided in the text (supported by numerous maps) along with contextual analysis. 3 - The VI Corps attack on April 2nd has no formal name, but Greene proposes the proper noun "The Breakthrough". Briefly - "Action Before Westport - revised edition"
At 44 years of age and counting, the late Howard N. Monnett's Action Before Westport, 1864 [Westport Historical Society/Lowell Press, 1964] remains the best single volume history of the Price Raid. I haven't actually held in my hands a copy of the original hardcover; but, as my own copy is a paperback facsimile reprint [Undated, Lowell Press (Kansas City, MO)] of the 1964 signed subscriber edition #87, I am reasonably certain of what's inside the first edition volume. In 1995, the University Press of Colorado reprinted Monnett's classic study on a POD basis [cover art above right]. Action Before Westport 1864 Revised Edition has a new, annotated introduction (17 pages in length) by the author's son, western historian John H. Monnett, and several other revisions and additions. A page of corrective notes is located immediately after the introduction, and Monnett has also included an updated and more detailed order of battle [revisions based on the research of Fred Lee, Lumir Buresh, and others] along with a number of photographs. The main text, endnotes, maps (3), bibliography, and index appear identical to the first edition. Overall, while the new materials might seem rather meager at first glance, I think the end product is worthy of purchase for new readers and for those who already own an earlier edition. 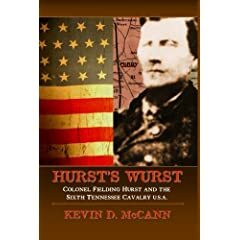 Author Kevin D. McCann utilizes a variety of sources to construct a slender military history of the 6th Tennessee Cavalry (U.S.) and its controversial commander, Fielding Hurst. Hurst, a wealthy slave owner from McNairy County, was a dedicated Unionist from the beginning. Disreputable in both private and public life, Hurst nevertheless maintained a notable career in public office after the war. While McCann acknowledges the colonel's wartime misdeeds and criminality (actions that frequently extended down the chain of command) the author urges some caution in judgment, with due consideration to the persecution he and other unionists suffered at the hands of Confederates. In terms of background, McCann makes the anecdotal case that the unionism of Hurst and his men was essentially based on ideology; however, a deeper social and political examination of the region would have enriched his study and enhanced its value. The majority of Hurst's Wurst's main text is devoted to a summary of the regiment's military service. Composed of West Tennessee natives, the mounted unit was initially welcomed by local Union commanders, as the men's local knowledge proved invaluable in performing scouting and counter-guerrilla duties. Unfortunately, requisitions for proper arms and mounts were often given low priority and even routine needs were never fully met. Effectiveness was further hampered by the inability of the officers to instill discipline [undoubtedly the lack of materiel and support from above had some effect upon performance]. An unfortunate penchant for plunder and extortion extended all the way to the top. The unit culture of the 6th was dysfunctional to say the least. Routed in a fight with Confederate cavalry at Bolivar in March 1864, the regiment's reputation plunged even further, leading the unit to be consigned to undesirable duties for the rest of the war. Rather narrowly focused on the military sphere, McCann's study does carry additional value for researchers. A complete regimental roster was included, as well as biographical sketches of the unit's officers. While the origins and overall complexity of West Tennessee unionism are not examined in depth, readers interested in Fielding Hurst's background and in the wartime history of the 6th will find Hurst's Wurst a worthwhile read. Briefly - "Lincoln and Douglas"
According to author Alan Guelzo, from his latest book Lincoln and Douglas: The Debates that Defined America [Simon and Schuster, 2008], much of the Lincoln-Douglas debate literature rests on the events themselves -- the 'battles' so to speak, leaving the 'campaign' aspect understudied. Addressing this deficiency, Guelzo frames the debates as dynamic events flowing through and around various local, state, and national political struggles. At the local level, the information controlling power of partisan newspapers (often the recipients of lucrative patronage appointments and printing jobs) is rightly considered. The turmoil over whether the federal government should accept the fraudulent Lecompton constitution (supported by Buchanan Democrats and vehemently opposed by Douglas) deeply fractured the Democratic party. President Buchanan wielded immense power as dispenser of patronage, and used it as a stick against Douglas Democrats in Illinois. I was surprised to learn to what degree eastern Republicans coddled Stephen Douglas in the wake of the Little Giant's Lecompton opposition, even to the point of pressuring Illinois Republicans not to oppose Douglas in 1858 in the hopes of winning him over. In state, many Whig-belt voters and recent ex-Democrats were also lukewarm Lincoln Republicans. In the end, neither candidate benefited from united party support. As for the debates themselves, Guelzo keenly analyzes their structure and key arguments -- mainly over issues of popular sovereignty, the Dred Scott decision, black civil rights, and the addressing of various conspiracy claims. As a tracking aid for the reader, the author devised grid boxes for each debate, comprised of double columns outlining point and counterpoint [a nice touch]. More than anything else, the issue of slavery's extension was the central point of contention, with two key philosophical questions rising to the fore -- is the federal government's role merely a guarantor of the democratic process within explicit constitutional guidelines or are moral impositions central to its obligations? American democracy's struggle over this question continues today, albeit over issues far less cut and dried than human slavery. Simpson Poll: 5 most influential Civil War books post-"Battle Cry"
War at Every Door: Partisan Politics and Guerrilla Violence in East Tennessee, 1860-1869 by Noel C. Fisher (UNC Press, 1997). The past 10 or 15 years have witnessed an explosion of important studies dealing with Southern Unionism. Fisher's comprehensive examination of East Tennessee politics, society, economics, and warfare is a fascinating model for others to emulate. Race and Reunion : The Civil War in American Memory by David Blight (Belknap Press, 2001). Others have come before it (including such notables as Reardon's Pickett's Charge in History and Memory), but Blight's work could probably be regarded as the most significant force behind popularizing memory studies, in the academic press and historical journal worlds and beyond. Apostles of Disunion: Southern Secession Commissioners and the Causes of the Civil War by Charles Dew (UVa Press, 2001). By specifically examining the secession movement in the words and deeds of its chief promoters, its underpinnings [at least those concerning the political framing elite] become indisputably clear. Pea Ridge: Civil War Campaign in the West by William Shea and Earl Hess (UNC Press, 1992). The number of exemplary campaign studies published within the last 20 years is legion, but I will single out an early one that also happens to be my favorite [yes, I did my part to make sure it made CWi's Top 50]; and, if this wonderful book led to more study and publishing interest in the Trans-Mississippi region, all the better. Lee Considered: General Robert E. Lee and Civil War History by Alan Nolan (UNC Press, 1991). We should be reminded that bad books can be just as influential as good ones. On the positive side, periodic iconoclasm can be refreshing, but Nolan's arguments tended toward silliness. Worse yet, rather than inspiring better studies, his work seems to have encouraged a stream of poorly argued polemical books, most having to do with Lee and Grant. Putting the Lee stuff aside, why writers and publishers continue to believe that Grant's stellar military career remains in need of rehabilitation is beyond me. Butcher Burbridge: Union General Stephen Burbridge and His Reign of Terror Over Kentucky by Bryan S. Bush (Acclaim Books, 2008). Hopefully, a measured approach underlies the provocative title. The Final Battles of the Petersburg Campaign: Breaking the Backbone of the Rebellion by A. Wilson Greene (University of Tennessee Press, 2008 2nd ed.). Model study is a descriptor too often bandied about, but Greene's history of the final moments of the Petersburg Campaign is truly such a work. For new readers and those who missed out on obtaining a personal copy of the Savas Publishing first edition, this 2nd ed. from UTP should be most welcome [note: the title and subtitle have been reversed between editions]. The Civil War in West Virginia: A Pictorial History by Stan Cohen (Quarrier Press, 1999 rev. ed.). An earlier edition I glanced through left me unimpressed, but this expanded & revised publication is a fine collection of photos and maps. Tainted Breeze: The Great Hanging at Gainesville, Texas, 1862 by Richard B. McCaslin (LSU Press, 1997). The Lincoln-Douglas Debates of 1858 eds. Robert W. Johannsen and James L. Huston (Oxford University Press, 2008). 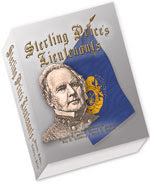 150th Anniversary reprint edition, with new introductory essay. Stone: "VITAL RAILS: The Charleston & Savannah Railroad and the Civil War in Coastal South Carolina"
Few Civil War books fully analyze the complex interactions and conflicting priorities between local business interests, national defense, and military operations. These spheres are often inextricably intertwined, but rarely more so than with the situation the Charleston and Savannah Railroad found itself in during the Civil War. This understudied scenario is chronicled and analyzed in fabulous depth by H. David Stone in his book Vital Rails. Begun in the 1850s, the Charleston & Savannah survived early financial and geographical travails and was finally completed just as the secession crisis boiled over. On the face of it, a direct land connection between the two great ports would seem to benefit all, but the story of its financing, construction, and early management provides an almost perfect case study of the economic/political localism and distrust pervading southern attempts at industrial modernization. When invading Union forces arrived on the coast soon after the opening of hostilities, the railroad proved to be an invaluable defensive asset. Stone credits railroad man and military officer Thomas F. Drayton with the germ of the idea, but Robert E. Lee fully developed in 1862 the very effective mobile defense-in-depth arrangement that protected Savannah, Charleston, and the railroad itself until the ultimate arrival of Sherman's army before Savannah in late 18642. Stone clearly demonstrates that the South's problems with its railroad system were as much managerial as material. While the author does not formulate a direct comparison with the by all accounts vastly superior northern system of rail coordination, he recognizes the Confederate government's critical error in never attempting to impose central control over the South's railroad network. Why this hands off approach, particular to railroads, was maintained cannot be fully explained. Stone properly maintains the reason cannot be simply ideological, as the Confederate government did not hesitate to assert itself in relation to other private industries. The Davis administration also consistently starved the railroads of replacement and maintenance materials, shunting the Confederacy's limited industrial output of iron and steel to armament factories and the navy. On the positive side, the C&S did possess some gifted and dedicated managers (e.g. Thomas Drayton, Henry Haines, and Robert Singletary) who successfully juggled regional military and commerce needs. They managed to keep the railroad operating under conditions which might have caused others to fail. Constantly forced to provide reinforcements for other theaters, the dwindling numbers of Confederates defending the rich coastal area between Savannah and Charleston increasingly relied on the railroad for rapid concentration in the face of near constant Federal attempts to break the rail connection. The author impressively recounts these military operations in a detailed fashion not usually found in similarly multi-focused works. The fact that there is a significant dearth of coverage in the literature2 for these campaigns makes Stone's study a particularly valuable piece of military, as well as economic, history. Cloth bound and heavily illustrated, Vital Rails is handsomely presented. However, the maps are a source of some concern. While a number of excellent archival reproductions and maps gleaned from published works were included [16 by my count]3, more original maps, and at a smaller scale, were needed as aids to understanding the text's often dense descriptions of operational and tactical movements. Perceptively analyzed and richly detailed, H. David Stone's scholarly, multi-layered history of the Charleston & Savannah Railroad from construction and ultimate destruction to troubled rebirth in the post-war period is a valuable contribution to the military and economic segments of the Civil War literature. It is earnestly hoped that this year's book award committees will give due consideration to this exceptional study. Highly recommended. 1 - Despite numerous attempts at its destruction (many of which are detailed in the text), the C&S was never seriously disrupted until Sherman captured Savannah, a remarkable achievement considering the disparity in men and resources. 2 - Useful recent sources include a pair of publications from Western Carolina Historical Research. 3 - Notable was a two page spread (orig. from Black's The Railroads of the Confederacy ) tracing all the rail routes inside the Confederacy, with particular attention paid to breaks and gauge differences. At the end of next month [ed. correction - the latest press flyer states July 08], University of South Carolina Press is scheduled to release Roger S. Durham's new study Guardian of Savannah: Fort McAllister, Georgia, in the Civil War and Beyond. Undoubtedly, military events will be the focus; but, more than that, Durham will detail the restoration efforts for the site, first by Henry Ford and later by the International Paper Co. and the state of Georgia. Being familiar with previous works on the subject, especially William E. Christman's pamphlet Undaunted: The History of Fort McAllister, Georgia (Georgia Dept. of Natural Resources, 1996) and "Among the Best Men the South Could Boast" (Caisson Press, 1997) by Gary Livingston, I have little doubt Durham's book will surpass them all. 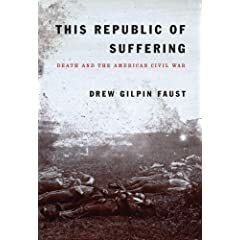 Faust: "This Republic of Suffering"
I would venture to guess that many local papers that rarely devote space to Civil War books have carried a review of Drew Gilpin Faust's This Republic of Suffering. A trip across death's landscape can hardly be called enjoyable, but if we may redefine its fringes to include a soberly inquisitive appreciation of the Civil War's uniquely grim (for Americans anyway) scale of death, then Faust's study fits the bill. The book is well organized, with the various themes surrounding death -- dying, killing, burying, identifying, mourning, believing, doubting, and accounting -- all brought together to form a cohesive narrative. The "Good Death" concept is a pervasive theme in This Republic of Suffering. Expiring in such a manner involved many elements -- a serene acceptance of death. with last words reaffirming a lifetime of faith in God and love of family. Even the condition of the body post-mortem (to include a "peaceful countenance") was a comforting confirmation of a Good Death. Behavioral science concludes that significant social pressures must be brought to bear before man's innate reluctance to kill can be overcome. Faust briefly discusses how Civil War combatants coped with the dissolution of this barrier. With the Union army's addition of burgeoning numbers of black troops to its armies operating in the South, she notes the particular weakening of restraint along racial lines1. The scale of civilian deaths, violent or otherwise, goes largely unexamined, but the author correctly notes the absence of systematic studies on the subject. The overwhelming task of burying the massive numbers of battle dead and attempts to ensure later identification for re-interment are detailed. Providing a "decent burial" for the dead of one's own side was a constant struggle; one that most often left little time, resources, energy, or desire for similar efforts to be directed at enemy remains. Faust ably traces the process of identifying and burying the dead, from a task with negligible resources and foresight devoted to it, to a later one of massive government expenditures and dedicated civilian and governmental oversight. While private burial and identification efforts are duly recounted, one of Faust's more intriguing (and oft repeated) contentions is that the scale of death marked a historical turning point in the degree in which the general government was obligated to its citizens on an individual level. The colossal departmental apparatus assembled by the war was put to work identifying the Federal dead and re-interring them in national cemeteries. The author credits this program, along with the massive pension system, with a significant role in transforming the U.S. government into a modern, paternalistic bureaucracy. For me, the most engrossing section of This Republic of Suffering was Faust's examination of how the scale of carnage affected the belief systems [e.g. religious convictions and faith] of the dying and the survivors. The targeted analysis of contemporary literature -- from the wit of Mark Twain and bitter irony of Ambrose Bierce to the poetry of Herman Melville and Emily Dickinson -- will resonate with many readers2. Faust's idea that the traumatic scale of killing meant that the description and meaning of the war's carnage could no longer be expressed through traditional narrative is memorably developed, if perhaps too broadly stated. While reasonable observers may differ with some of Faust's generalizing conclusions about the degree of transformation wrought by the Civil War's death toll in terms of American culture and government, her arguments are worthy of considered thought. Not an exhaustive treatise, Faust's study should be evaluated/appreciated for what it is -- an artfully written popular history selectively conveyed through the eyes of mostly recognizable figures. In a field awash with such works, This Republic of Suffering tackles a particularly difficult subject in a manner far more engaging than most, and often rings true. 1 - The idea that the broader commonality of the cultures of the North and South bred a more restrained attitude toward killing fellow whites is largely true, but is a bit overgeneralized in Faust's study. Many significant departures existed. A particularly grim example would be the northern dehumanization of white, pro-slavery Missourians as "pukes" [a troubling viewpoint stemming largely from the Kansas border troubles and vividly characterized by Michael Fellman in his classic study Inside War]. 2 - The snapshot assessments of Bierce and Melville are fine, but it's clear that Faust has a special regard for the poetry of Ms. Dickinson. Can't say I blame her. Research Series 59. A Survey of Civil War Fortifications in Charleston, Beaufort, Berkeley, Hampton, and Jasper Counties, South Carolina. 2000. Michael Trinkley and Sarah Fick. ISBN 1-58317-054-5. This particular volume contains a number of maps, both overlays and large pull outs that trace and mark the sites under study. Photographs, tables, and drawings are also included. It appears to be quite useful for Civil War research, but does read like a government report so don't expect a pleasurable narrative or much background information. I wonder how many other states have similar offerings. Lankford: "Cry Havoc! 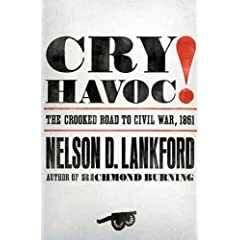 : The Crooked Road to Civil War, 1861"
With his new book Cry Havoc!, Nelson D. Lankford imbues his narrative of the lead-in to Civil War with immediacy, reminding readers at every turn that decisions have highly uncertain outcomes. No single person has control of events and nothing is inevitable. While most overviews of the ‘secession winter’ period focus intensely on the Charleston-Montgomery-Washington D.C. nexus of people and events, the author of Cry Havoc! has taken a fresh approach. With the complex diplomatic interaction surrounding the Fort Sumter crisis ably deciphered in recent works by Maury Klein and David Detzer, Lankford centers of his attention on the conflict between secessionists and unionists from the states of the upper south. 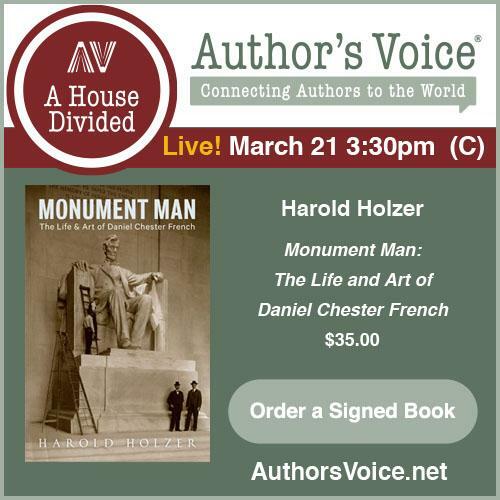 Drawing from eyewitness accounts as much as possible, the author ably creates a picture of the divided political loyalties of the citizens of Maryland, Virginia, and North Carolina. Perhaps not surprisingly given his own background, Lankford’s attention throughout gravitates toward Virginia. Historically neglected Virginia unionist leaders such as John Janney and John Baldwin are given their due. On the other hand, some readers may take issue with the Virginia-centrism of the narrative. The story only briefly ventures west of the Alleghenies, covering similarly complex divisions in the political landscapes of the western upper south states of Tennessee and Arkansas with only a few sentences. While individuals north and south (then as today) recognize Virginia’s leadership position, perhaps a wider geographical examination would have been appropriate. Mr. Lankford writes gracefully, masterfully evoking the stress and uncertainty of the period, and his critical analysis of the actions of the principal actors is calmly evenhanded. 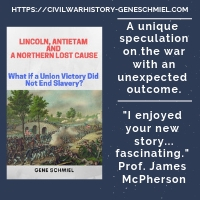 His deep appreciation of the concept of contingency in relation to the decisions made at critical moments over places like Fort Sumter, Gosport Naval Yard, Harper’s Ferry, Baltimore, and Annapolis is thought provoking and sure to inspire discussion among readers. Thankfully, the author does not use the opportunity to engage in manufacturing a detailed counterfactual history. However appropriate the metaphor, the crooked road and the straight one both lead to the same end. The valuable service Nelson Lankford provides is his sharp eye for the important side roads. The final destination of these pathways can be debated endlessly, but will always remain impossible to predict with any degree of certainty. What we do know is that the alternative routes leading to an irrevocably different historical end can often be indistinguishable from the main road—just as easily taken as passed by.